Only in Canada! Outsiders will be excused for wondering just what the hell Canadians are drinking these days. Well we now may know what's behind the political shenanigans. First the Liberals, who were soundly trounced in the recent general election are angling to defeat the governing Conservatives and form a coalition government with the rump New Democratric Party and the lock-step support of the separatist Bloc-Quebecois - a regional Quebec-only political party. So we may soon have a separatist influenced national government. 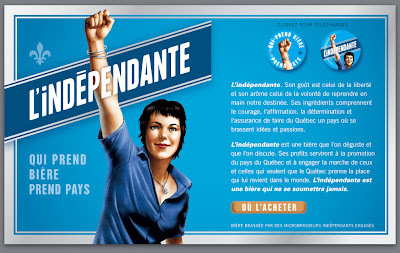 If that weren't enough, there's a company out to upset the national beer market in the country with the launch of L'Independante beer! It's a move the Globe and Mail refers to as "brewing up support for sovereignty".